In Tod und Verklärung, Strauss took two steps back to second-hand Liszt and Wagner. Of his four most popular mature instrumental works, this is easily his least-inspired, although structurally it's one of his most original works. For one thing, his orchestral imagination – so fecund in Don Juan, where he created unheard-of sounds – seems to sputter fitfully and to settle for nineteenth-century routine. The large orchestra here generally contributes little more than volume. Two genius strokes save the work: the opening "deathbed" sequence and the dramatic "ideals" theme. Some critics have trashed this theme and its final working out in the "transfiguration" as banal, but for me the trouble with the section has always lain in the interpretation, rather than in the score. The weak parts of the work are the allegro sections, which offer little more than rehashes of Liszt's Hunnenschlacht. Compare these sections, for instance, with comparable allegros in Eulenspiegel (his next tone poem) or the battle sequence of Heldenleben. A conductor must successfully vault three hurdles. First, he has to get through the "struggles" section without allowing the audience to reflect on the quality of the material. Second, he must bring off the "dreams of childhood" section and stress its connection with the "ideals" theme. Third (and most important), the work must build and climax with the "transfigured" peroration. As we know from his letters and his own program description, Strauss designed the score so that the finale takes the emotional burden of the piece. If the finale doesn't come off, the work fails. "Death" has too little sting to carry tone poem all by itself. Stokowki's reading is a good one. The Philadelphia sounds superb and plays with a rhythmic precision not normally associated with it. Subsidiary lines sing out clearly, even through the snaps and crackles of historic recorded sound. In fact, the transfer to CD is quite fine. Stokowski keeps things moving and meets the first requirement of getting through the allegros. He also is one of the few who brings off the love scene. Strauss, in this section, really does commit the sin of overscoring (this happens, by the way, less often than most critics lead you to believe), and the busy subsidiary texture tends to bury the main theme. Still, this becomes a performance of moments. Stokowski conveys little sense of thematic connection between sections. In the finale, Stokowski loses his way by starting at too high a dynamic level and by an inability (through careless attention to balance) to bring out the main argument – a slow struggle to restate the "ideals" theme. Once he reaches that motive's first full statement, however, he's fine, and the conclusion glows like a sunset. Reiner gets off to a slow start. The "deathbed" scene just marks time until the first allegro, at which point the piece takes off like a shot, to the first statement of the "ideals." Reiner brings off a superb diminuendo transition to the "childhood" section, which again marks time until the next allegro. From here, all goes well and, in the finale, magnificently. Here, Reiner convinces you that the piece inhabits the rarified altitude of a Mahler finale or of the song "Ich bin der Welt abhanden gekommen." Reiner demonstrates that, although certainly less complex, Strauss strives for transcendence in roughly the same language as Mahler. Both composers probably got the basic procedure from Wagner's Liebestod. A critic like Del Mar, who sees this section as Strauss merely decorating a chord, misses the point. Strauss very subtly manipulates motives, rather than harmonies, to build one of his most impressive symphonic arguments. Reiner does the hard stuff well, but he seems to lose attention in the easier matters. Despite a great finale, the performance overall settles into the good, rather than the great. The mono sound is acceptable. The surface noise has been eliminated, but a hiss lingers. Not only an unsurpassed performance of this particular work, one of the great Strauss recordings. Szell's well-known attention to the score generates touches simply missing in other readings. Take the opening: the irregular rhythm of eighths and triplets in the strings and timpani for once is the correct irregular rhythm. Stokowski, for example, misses the triplets in the strings (it sounds like syncopated eighths) but gets them in the timpani. Szell's mastery of detail is important, but it's not the whole story. Many have misapprehended Szell as a soulless technician, an error not helped by the conductor's admirers who talk of his precision to the exclusion of his other considerable virtues. Technique is indeed a requirement in playing Strauss, but it's a basic requirement. Szell shows plenty of spirit as well. The opening sounds with all the solemnity of Siegfried's funeral march. Indeed, Szell emphasizes Wagnerian connections throughout. The allegro sections could have come from Dutchman, the heroic sections from Siegfried. Still, there's plenty of Strauss himself in the score, particularly in the "hammer blows" (Del Mar) from the trombones in the "struggle" sections. Szell doesn't reach Reiner's near-hysteric level, but he not only carries off these moments, he seems to raise their musical value. For once you don't feel as if you've gotten knock-off Wagner, but something at Wagner's level. In my opinion, it's an illusion, but, as long as Szell has the floor, I believe it. The real glory of the performance, however, is the finale – even better than Reiner's. For one thing, Szell's interpretation is uniquely his own and does not depend on reminiscences of Mahler. Still, the reading takes off into the transcendental. This represents a serious and penetrating rethinking of the score. It's a basic document of Strauss performance. The sound from CBS (apparently an untouched transfer of the 60's LP to CD) is bass-heavy, probably in an attempt (unsuccessful) to eliminate tape hiss, but one can live with it. This poetic reading haunts you. Kempe's shows his strengths: fantastic clarity of texture, concern for orchestral color. Unfortunately, although they count to the good, this piece needs them less than other Strauss works. The performance opens well. The Dresdeners play the "struggle" allegro very well indeed, but Kempe can't make you forget the Lisztian rhetoric. The same problem bedevils the later "passion" segment. 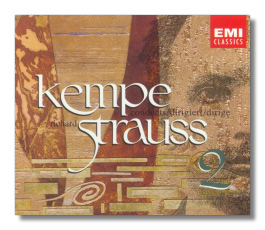 In the finale, Kempe takes the same approach as Reiner, but even with the advantages of stereo and a better orchestra, fails to reach that exalted level. A fine job, but not a great one. Because of Horenstein's eminence as a Mahlerite, the performance may intrigue some. Unfortunately, it never registers more than okay. The London Symphony Orchestra plays sloppily at times. The orchestral tone could stand improvement. Most damaging, Horenstein gives little insight into the architecture of the piece. The finale surprises in that it's not all that Mahler-like. The orchestra makes a big noise, but to little effect. Like almost all of Karajan's late work, the interest of the performance lies almost exclusively at the beginning. Even though the opening rhythm is incorrectly beat (this time, all triplets, rather than the alternating syncopated eighths and triplets), one can't deny Karajan's "Isle of the Dead" effectiveness, clear and wispy as a wraith. The allegro plunges into nineteenth-century blood and thunder and the second, martial allegro and ensuing "love" section come mired in stodginess. From there, the reading settles into a concern for little other than sound, rather than cohesive argument. The sound is sumptuous, if unfocussed, but the work has to amount to more than a matter of decibels and the number of brass players. The reading goes nowhere, from a marvelous start – fairly typical of late Karajan, actually. At the finale, however, Karajan takes the reins again for a magnificent peroration – purposeful and coherent. Glorious support from the Berlin Philharmonic helps, of course, but why he winks out beforehand is anyone's guess. The most immediately noticeable part of this performance is the overwhelming Hollywood-fantasy-super-orchestra recorded sound. No mere human musicians sound this good in real life. Fortunately, once you get past the sound, you find more than enough musical reward. Dohnanyi is one of those rare conductors who never gives a routine performance or interpretation. His Dvořák 8th, for example, generally considered one of that composer's more joyful works, revealed an unexpected dark side. You may ultimately not agree with Dohnanyi, but you can't dismiss him, either: his discipline and intensity show too much. He forces you to engage his ideas. The opening broods like darkness on the face of the deep. The "struggle" allegro works up to magnificent fury. This section alone lifts Dohnanyi's account above the common run. Among its many glories, note a superbly-judged gradual accelerando from the first appearance of clouds to the unleashing of the storm. He pushes the climax to the edge of bombast without (unlike his Don Juan with the same orchestra) quite stepping over. The "childhood" section starts with breathtaking clarity: you not only can hear the individual notes in the introductory string accompaniment, you also hear how Strauss distributes these runs among the sections. Dohnanyi revels in the Wagnerisms of the "heroic" and "love" allegros. The three closely-spaced statement of the "ideals" theme connect with their linking passages, where other conductors gloss over these in their rush to reach the Big Theme. Dohnanyi raises the importance of the links. The finale, beginning as an inexorable slow march to the "ideals" theme, contains the biggest surprise. Dohnanyi holds back. Most conductors tend to hit the "ideals" climax for all it's worth. Dohnanyi prefers to treat the finale as a last working-out of motives, paying Strauss the compliment of taking him as a serious composer of a work which adds up to more than One Big Gorgeous Theme. It pulls you up short, forcing you to re-evaluate this very uneven piece. With the Szell, a must for Strauss lovers. Why does Strauss continue to attract Ashkenazy? He has recorded quite a bit of the composer without any real success. In fact, he has really yet to demonstrate that he comprehends Strauss' material and methods at all. With one of the great Strauss orchestras at his disposal, Ashkenazy does no better than average. Comparing this reading to Szell's classic account with the Cleveland, you'd hardly credit it was the same orchestra: mushy string attack, slovenly rhythm. Ashkenazy seems to have no sense of the logic of the piece: it's just one thing after another. The work may have its flaws, but it's not aimless, as here. On the whole, an account that, at its best, rises to the routine.